Thaba Tsweni Lodge is a warm family run lodge nestled in the heart of the Blyde River Canyon , Panorama Escarpment Route and the Mpumalanga Province of South Africa. At an altitude of 1370m, Malaria is unheard of, even though the Lodge is only 48km from the Phabeni Gate to the Kruger National Park. The Lodge opened in 2000 and is owned and managed by the Hough family. We welcome you to share our little piece of paradise. Thaba Tsweni Lodge is the perfect place to relax and unwind for a while or if you feel so inclined, test your limits by doing some of the adventure activities in the area. The Lodge is perfectly situated to use as your base, to visit all our local attractions such as the Blyde River Canyon or the Kruger National Park, which is only 45 min., drive away, and accessible for day excursions. Many other leisure and adventure activities can be arranged for you on request. 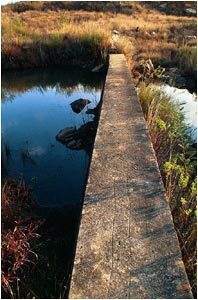 Thaba Tsweni Lodge is on the farms Berlyn and Lisbon, which is walking distance from the Berlyn Waterfalls. It is still close enough however to all the necessary amenities, being only 9km North of the town Graskop and 32km from Sabie. The farms Berlyn and Lisbon, have an interesting history. 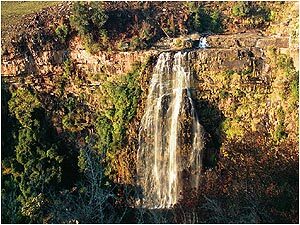 In the 1870’s, a gentleman by the name of Billy Davies was prospecting for gold, in the vicinity of two large waterfalls. He was suddenly attacked, by some hostile native inhabitants of the Bapedi tribe. He fled the scene and hid in a cave close to one of the rivers, today the Lisbon Waterfalls. 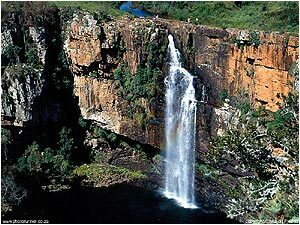 While hiding away, he found traces of workable gold and named the place “ a wall of gold”.The locality of this wall of gold is in the vicinity of a large belt of leaders, on the northern side of the Waterfall River. 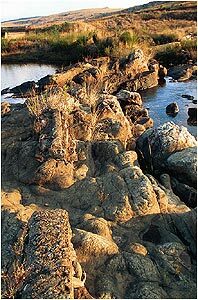 This river flows in the valley in front of Thaba Tsweni Lodge, close to the Lisbon Waterfall. The discovery of payable gold, brought other people into the area, in 1882 a Mr. Gwynne Owen arrived in Pretoria with some fine samples of gold mined from the above mentioned area. He had purchased the land where the gold had been discovered and named them the Berlyn and Lisbon farms, after the Berlyn Waterfall and Lisbon Waterfall. Mr. Owen took these samples of gold to London, to attract further investors to the area, and thus the Berlyn-Lisbon Gold Fields Pty/Ltd was floated by one Baron Grant of England. Alluvial gold mining activities, took place on these farms from 1884 to 1890, and remains of this mining activity such as mine tunnels, fortifications against local inhabitants, weirs and water races can still be observed today, one hundred years later. It is interesting to note that the mining activity was the first Hydraulic mining in South Africa. Today however, nature is again taking over. 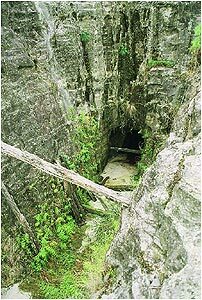 The mine tunnels have become home to species of bats and the endangered bird species such as the Blue Swallow. The weirs have become hatcheries to species of indigenous fish. With only peace and tranquility to surround you, Thaba Tsweni Lodge can be your secret getaway, within the boundaries of the Blyde River Canyon Nature Reserve which has recently been proclaimed the Kruger to Canyon Biosphere Reserve, by UNESCO.